3 Ways to Play Walker - Ford F-150, Raptor Electric Magenta is rated 4.8 out of 5 by 13. Your baby has never looked cooler than behind the wheel of this lifelike Ford truck. Rev your engine and get ready to put the pedal to the playtime metal! When you need fun in high gear, this baby walker is the perfect pick-up truck for the job. 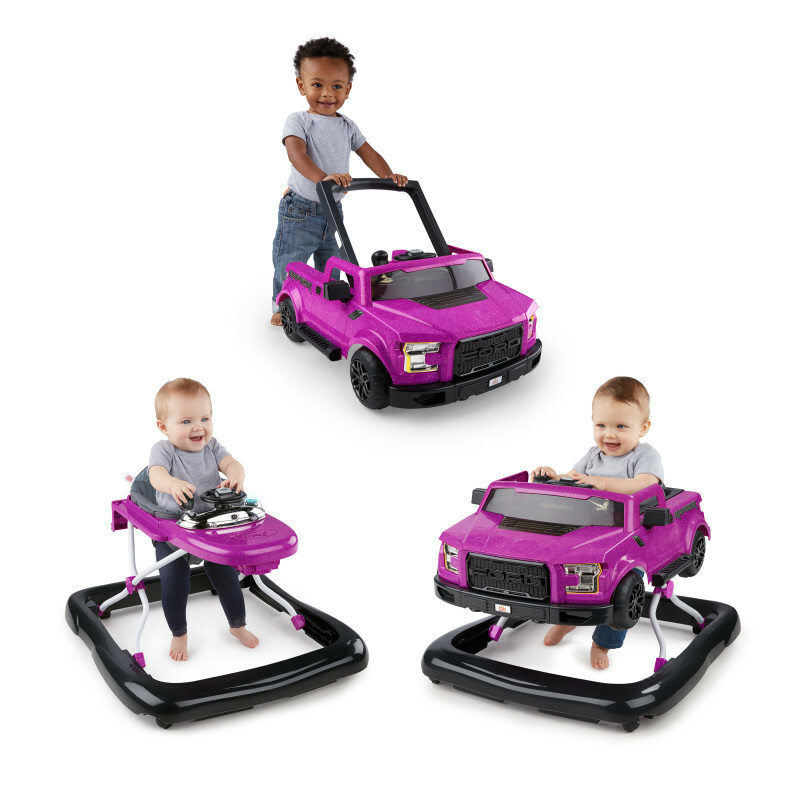 The electric magenta walker is Built Ford Tough to support multiple stages of play. In normal walker mode, pre-walking drivers can steer around the house with extra stability and support. More experienced walkers can use push-behind mode to “hit the road” inside your home. The authentic truck sounds, lights, gear shifter, steering wheel and the look of this rugged walker will drive your baby’s imagination ("Wow! I'm just like mom and dad!"). The removable steering wheel activity center can be used for floor play or on-the-go. Rated 5 out of 5 by momandteacher from Love the possibilities! This is one of our daughter's favorite toys. She loves pushes the buttons and we like that this toy has 3 different ways to play. We have only used it the 1 way - our daughter sitting in the car, but it is one of our most used toys. I definitely know that we will be using it as she transitions into walking. This is a toy that we would buy for other parents for their kids! Great product!!! Rated 5 out of 5 by pri9949 from hot favorite of my toddler I just love this toy as it has such longterm use. the color is just as shown in the picture and the product is quite light in weight although it looks bulky. the product is easy to put and has easy instructions.my toddler girl loves playing with it and just keeps her busy for so long. I love it. Rated 5 out of 5 by KA AL from Great features, very fun toy for our child! We got this a few weeks ago and our daughter loves it! Pretty colors too. She likes to go back and forth and I find it entertains her for hours!!! It is great. You should have a relatively big open space to use it...Thank you!! Rated 4 out of 5 by nrcooley from Versatile Product Offering Great Entertainment This adorable walker offers great entertainment for baby with 3 different ways to play, two walker options (1 large and 1 small) and a floor standing push walker. It has a removeable steering column that plays sounds and music that you can use on either walker option or as a floor toy. The only reason I gave this product 4 stars is that it doesn't move well on carpet and it is a bit bulky when using the large walker option. Rated 5 out of 5 by R Hall from Awesome My little one LOVES this thing! It's very versatile and grows with your little one. It seems to be sturdy and takes all the abuse my little one throws at it. It hasn't tipped over not one time with her in it, and she loves to be able to push it around. Rated 4 out of 5 by littlepinkheart09 from Lots of fun for those on the go! The Ford F-150 Raptor, 3 Ways to Play Walker is a really fun walker and great for boys and girls to enjoy! I was impressed by how easy it was to put together and the only thing I needed a screwdriver for, was to put in the batteries! All the pieces easily snapped together and the instructions were simple. Just like the name suggests, there are 3 play modes, two of which can be used by two different children at the same time, which I thought was very cool! This product includes both a baby walker for infants and a walk behind push-style mode for older babies who can stand. The truck is really adorable and I love that you can buy it in magenta too. It also includes a steering wheel with stickshift and horn that can be removed and reattached between pieces/walker modes. Rated 5 out of 5 by Courtney B from Great toy to help pre-walking baby! This product couldn't have come at a more perfect time. My 10-month old baby is learning to walk, and this toy is perfect for her learning. I love how the walker has three different settings and can grow with her! My husband had a fun time decorating it as he set it up for her, too! Rated 5 out of 5 by Garjoyce from Husband is in love! If your significant other loves ford then this is the perfect choice lol. It was super easy to set up. I received this in pink and love that it has glitter to it. One thing is that it is not good on carpet so keep that in mind. It definitely is different than other walkers as it converts to a push toy. I highly recommend your little one will love playing with it and it definitely grows with them.